BOSTON—In what seems to suggest acute homesickness among the colonists, historians at Boston University said on Wednesday that newly uncovered documents indicate that most pilgrims sailed back to Europe in the fall of 1623 to celebrate the first Thanksgiving at home. 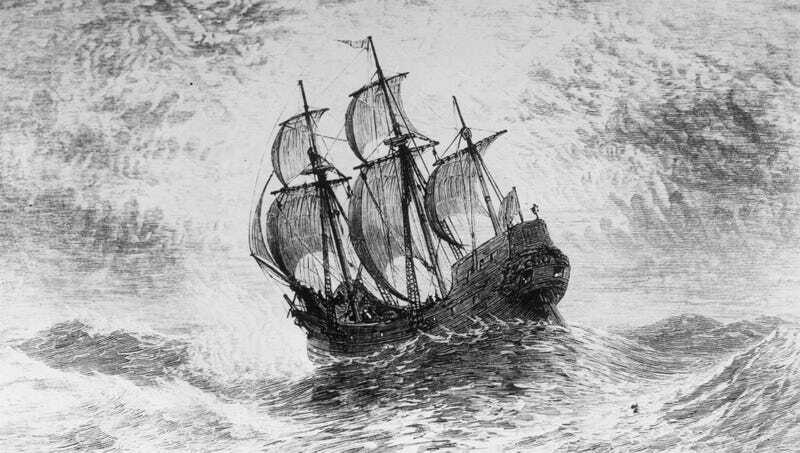 “What we see from personal diaries and ships’ logs is that the majority of these settlers, rather than stay put and observe the holiday in Plymouth, decided to brave the three-month journey back across the Atlantic to be with family and friends,” said professor Willa Sinclair, adding that the few pilgrims who remained in the New World either couldn’t afford the trip or refused to go if their father was bringing his new girlfriend. “They were willing to endure the crowded, often horribly delayed ships for a taste of their mother’s home cooking complete with all the traditional Thanksgiving fixings.” Sinclair went on to say that from the second Thanksgiving onwards, however, many Pilgrims decided to just go out for dinner and be done with it.